Today we are going to share our experience about a very familiar story to Brazilian entrepreneurs trying to internationalize. After making a decision that Canada is the right place for their new business endeavour, most believe that two things are enough to succeed: Contacts & Resources. But is that really all they need? Companies tend to believe that if they are introduced to the right potential business partners and institutions, business will soon follow. These introductions can happen in a number of different ways: one-on-one meetings at international trade shows or trade missions; direct introductions by the government, chambers of commerce or matchmakers; qualified lists of potential clients, etc. 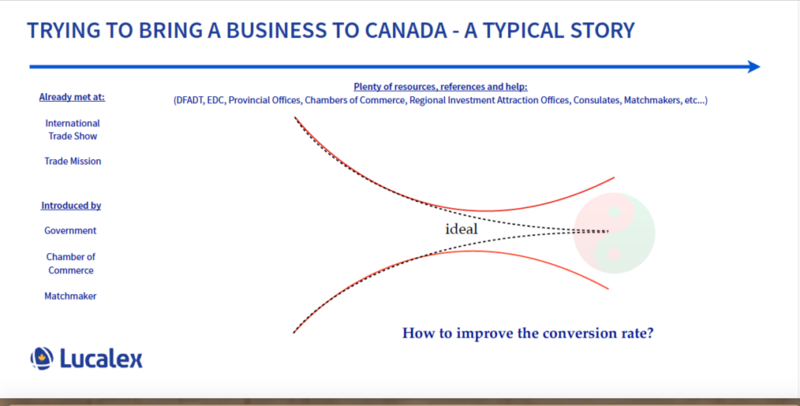 In Canada, there is abundant help available to entrepreneurs, be it from different levels of government, agencies, incubators, accelerators, regional investment attraction companies, matchmakers… All of them do a great job and provide a large amount of very detailed information on “how-to” do practically everything to do business in Canada. So, if you have the Contacts who could do business with you, and if you have the Information and know how to get things done, it is reasonable to come to the conclusion that this would be enough to successfully do business in Canada. But, unfortunately, this is not what evidence shows. According to our experience observing and working over the last 10 years with companies in the Brazil-Canada space, we observe that only about 2-5% of companies that take active steps towards internationalizing into Canada (have Contacts and Information) actually end up conducting any significant business. What typically happens is that in the first six months you initiate your contacts, things seem to go well. After that, things get stationary and do not evolve. We’ve seen this happen a lot – in at least 95% of the cases. We, at Lucalex, believe we know why these things happen and we trust we found an antidote. The reasons root back to a very different business environment that shapes the way Brazilian entrepreneurs think in contrast with reality they end up finding in Canada. The business environment and the business culture in Brazil are very distinct. What is a problem in one country is very different from what is a problem in the other, and the key success factors in Brazil are very different from what such factors are in Canada. We understand that very clearly. We see clearly that, for those business cases that do not materialize, clear reasons can be traced back to cultural differences in the way of doing business. This is why there is such a low conversion rate (interested companies converting into successful ones) of Brazilian businesses co to ing Canada. But we are here to help turn this around. Get in touch with us to learn more.